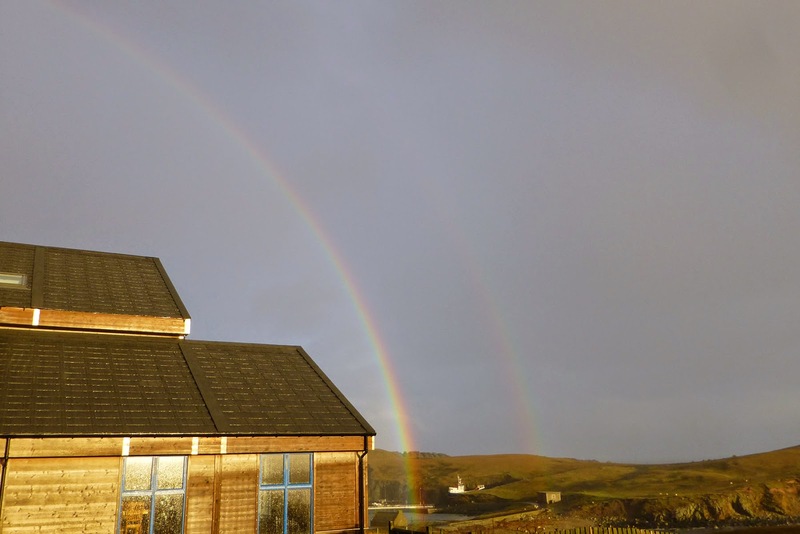 Fair Isle Bird Observatory: the Warden's diary: Many Happy Returns! OK, apologies first – I had to go off the island in October for a short while and then Susannah was away with the kids, so I was helping to cover the Administrator’s job as well and then there was just so much to catch up on that I didn’t know where to start with the blog. Then more stuff happened so there was no spare time, then I went away with the kids for a long-weekend visiting, which the weather made into a long week, we brought back norovirus, then it was nearly Christmas, so sorry for not keeping the blog up to date. Hopefully you were able to keep in touch with the news throughout the autumn via Facebook or Twitter though. 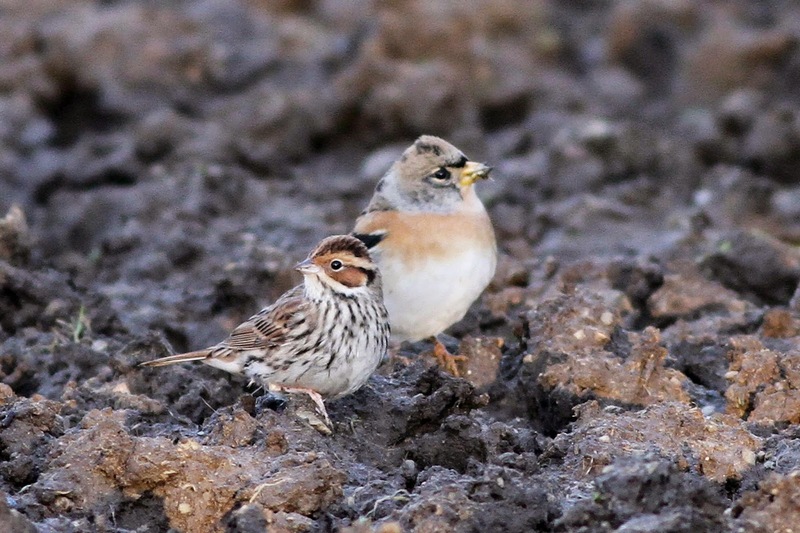 Little Bunting and Brambling (Paul French). It was a very good autumn for the former species. 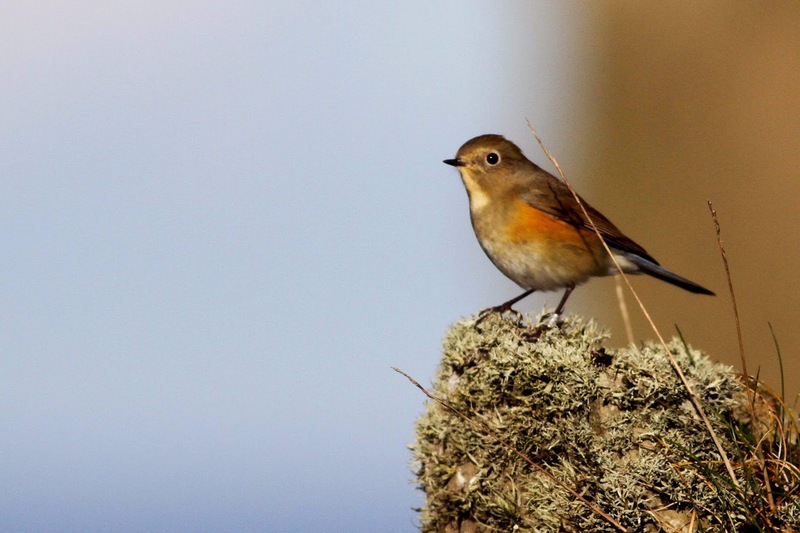 Red-flanked Bluetail, Skinner's Glig (Paul French). Relocated here four days after being ringed at the Obs and not seen during the intervening days. It was a strange autumn in some respects, with some of the ‘big rares’ just missing us and a perception that Fair Isle had a quiet autumn, but with White’s Thrush, Grey-cheeked Thrush (our 2nd consecutive year with a record), Lanceolated Warbler, Red-flanked Bluetail (trapped at the Obs) and an intriguing ‘Stejneger’s’ Siberian Stonechat, along with back up in the form of a couple of Arctic Warblers, seven Olive-backed Pipits, three Red-throated Pipits, a decent spread of scarcities and some really good thrush falls that brought good numbers of Robins, Woodcocks and other common migrants, the birding was rarely less than very enjoyable. 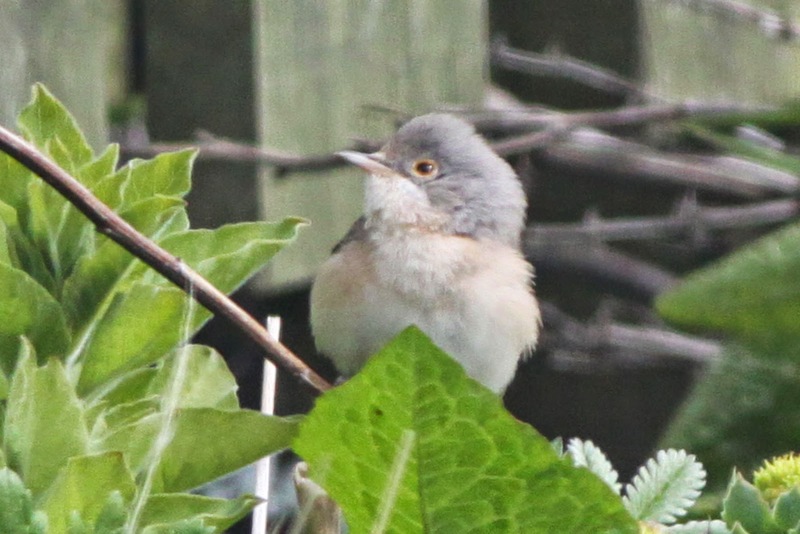 I suppose we’re the victim of our own success in some ways, with a roll-call of rarities that would surely be the envy of most other sites (maybe even counties) in the UK, but one that didn’t quite hit the heights of previous years and perhaps paled in comparison to our immense rarity-filled spring. 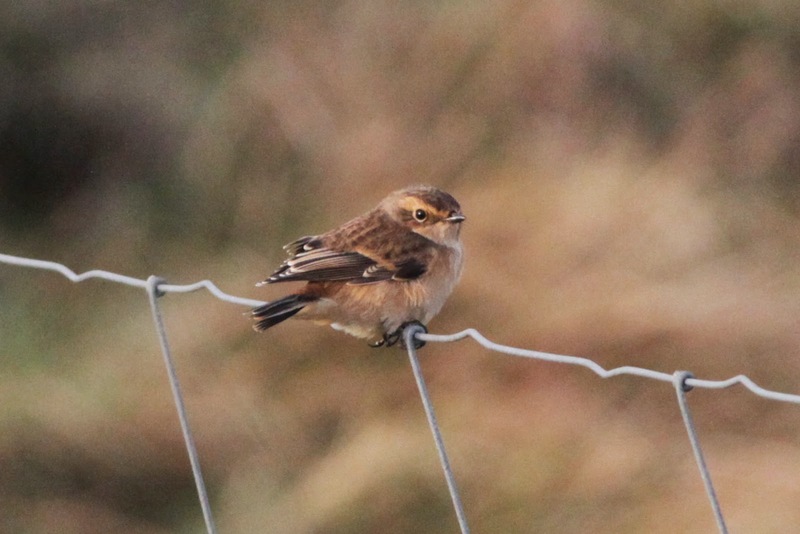 The Siberian Stonechat that arrived in late October and appears to be a very good candidate for Stejneger's Stonechat. As the autumn progressed though, it became apparent that our epic spring had left us with a rather healthy year list and, despite a couple of quiet spells where we hadn’t added that many species (mid-August and late-September in particular producing some decent conditions, but not many new birds), we were still in with a sniff of the record. When I last left you, we had just added Treecreeper, our 212th species of the year on 9th October, but there weren’t too many gaps in the year list that would make the five species needed to equal 1992’s record 217 species easy to find. 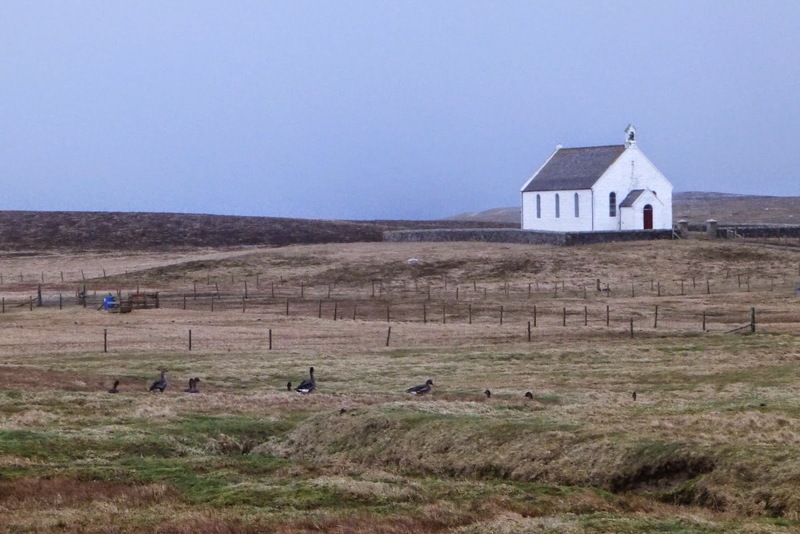 In fact, we had to wait almost a week before the next addition, our seventh ever Firecrest on 15th, followed two days later by a brief Rough-legged Buzzard, then strong westerlies saw the most obvious gap remaining filled with the first of several records of Greenland White-fronted Goose (21st). 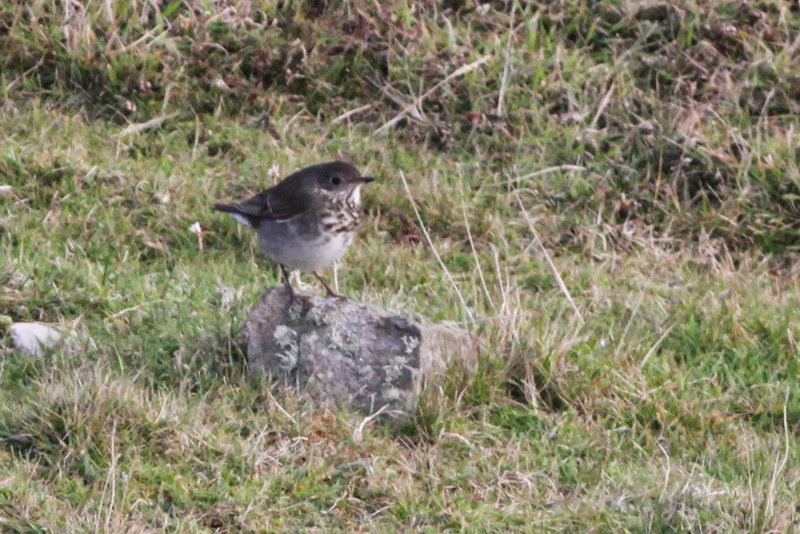 Two species to go to equal the record and we eventually cashed in on a displacement of Nearctic passerines with a superbly showy Grey-cheeked Thrush at the Obs on 24th. 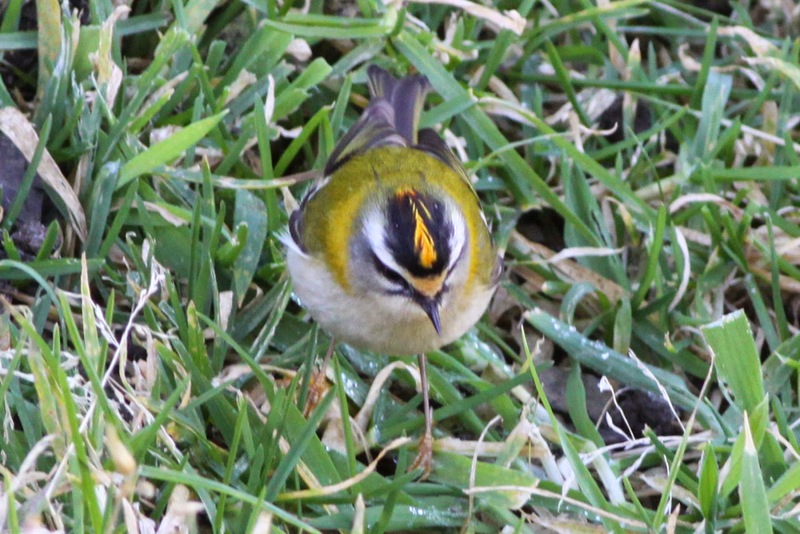 This Firecrest in the Raevas was one of the highlights of the autumn in terms of looks. This Grey-cheeked Thrush kept up the recent good run of autumn American passerines, with 10 individuals of 6 species in the last eight years (that's more than St Agnes in the same period I believe), keeping up the discussion on whether this apparent shift in the focus of trans-Atlantic waifs is weather or observer related. Another quiet spell followed, with further westerlies eventually giving way to some more productive winds at the end of the month that produced more birds (including the Stejneger’s Stonechat), but no additions to the year list. 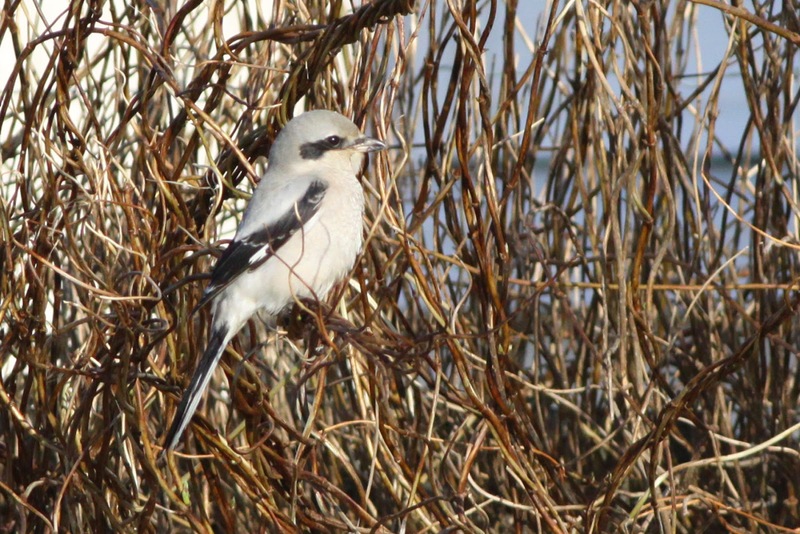 A very good year for Great Grey Shrikes saw four individuals recorded in the autumn. This bird was at Lower Stoneybrek and was later caught at the Plantation and remained around the Obs until 10th November. We were well into the second week of November (very much the 90th minute of the migration season to use a football analogy) when Susannah struck with her finest birding moment on Fair Isle to date, a Shorelark at Lower Leogh on 10th; species number 217. The wind stayed in the SE for the next week, birding was fairly intense (whenever the rain allowed) and eventually another wave of thrushes brought in species number 218 – a smart male Bullfinch in the Wirvie Burn on 17th. There were no more new species after that, although in early December the BOU upped the total by one more with the splitting of Moltoni’s Warbler (see here for details of that one from the spring, our rarest bird this year as it turned out). We've still got over a week to go, so it's possible this remarkable year will spring one last surprise, but we'll settle for 219 species! You’ll find all the up to date sightings here. So, thanks very much to the team and our guests and visitors for all the hard work needed to get to this impressive total. In the grand scheme of things, a year list record maybe doesn’t mean a great deal, but it’s a great way to remember a really good birding year, in which other ornithological highlights have included three new species to the Fair Isle list (Glossy Ibis, Bridled Tern and Moltoni’s Warbler – with Caspian Stonechat, Southern Italian Eastern Subalpine Warbler [they really need to sort the taxonomy and names of this species out soon! ], sinensis Cormorant and possibly Stejneger’s Stonechat amongst the new subspecies noted, although the latter subspecies may well have occurred previously), the best seabird breeding season for several years and the highest number of birds ringed since 1998. The Obs team at the start of the season (none of us looked like this by the end of the year!). Other staff members came and went, each bringing their own strengths with them. Another year of a good bunch of people and some lasting friendships. There are plenty of other things to catch up on, but I think I’ve gone on long enough for now, so I’d just like to take advantage of the season of goodwill to catch up on a few thank yous to everyone who has helped FIBO and Susannah and I through our fourth year running the Obs. First of all to all the FIBO staff (and we include the visiting RSPB researchers in this, as they feel very much like part of the FIBO team); we’ve seen our fair share of blood, sweat and tears this year but we’ve enjoyed having all of you here, we want to thank you for all your efforts and we’re glad we’ve made some friends who we'll hopefully stay in touch with well beyond our FIBO years. Also, to all our volunteers, we hope you enjoyed your stay as much as we enjoyed having you here and we look forward to seeing some of you here again. Technically also volunteers have been our various family and friends, particularly our parents, who have provided all manner of help when visiting us. Also falling into the category of volunteers are the FIBOT Directors and we want to thank you all again for your help during the year. The work that the Directors put into the successful running of the Obs, be it sorting finances, shifting vans or engines from Grutness, manning stands at Birdfairs, running research projects or just answering our enquiries about everything from petrels to people carriers, is very much appreciated (and a special thank you to Roger Riddington, who stood down as Chairman this year). 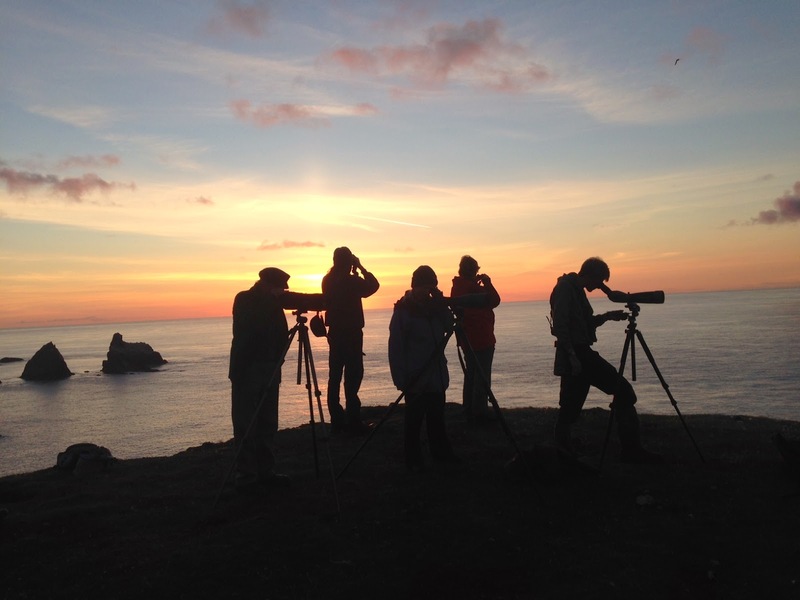 We also appreciate the support given to us by JNCC, SNH, SOTEAG and the Seabird Group. The Fair Isle community is a unique group of people and it’s obvious to say that FIBO couldn’t run the way we do without their support, so thank you to everyone on the island, especially those who have answered our calls for help during the course of the year. Of course, without all of you who support the Obs by visiting, being members of FOFI or sending donations, there wouldn’t be a FIBO, so the biggest thanks is due to you. Personally, I have to thank Susannah as well (and not just for the Shorelark! ); running an increasingly busy Obs (it was another record year for visitor numbers) and looking after me and the kids isn't easy (in fact, I reckon it must be the hardest job at the Obs) but she does it very well, as I'm sure anyone who has visited us will agree with. Thanks love. A busy year, but a fun one, for us, the Obs team, visitors and islanders, with plenty of highlights all round (photo: Ciaran Hatsell). So now the shortest day has passed, we’re finally getting caught up with the office work and our thoughts are turning to the rapidly approaching 2015. 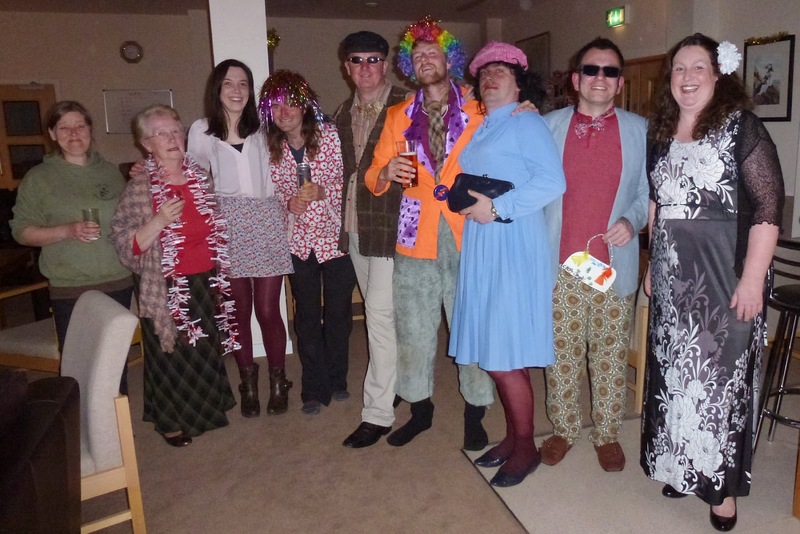 Staff and volunteer vacancies are now up on this very blog if you’d like to join us as part of the team next season (although note that we’re out of the office until 5th January, so we’ll not be able to answer emails until then), but for now, Merry Christmas and a Happy New Year, may all your birding in 2015 be fun. Christmas is coming, the Tundra Bean Geese are getting fat (well, they've been lingering on the island for over a month now and seem to be doing quite well, although numbers have dropped from 13 to 9 this week).